Line A measures from the middle of the poll down the front of the face to the tip of the nose. Line B measures from the middle of the poll down the middle of the head to just above where a nose band or halter would sit. 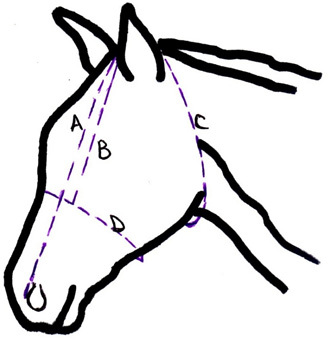 Line C measures from the middle of the poll behind the ears and goes below the jaw where a throat latch would go just to the middle of the underneath of the jaw. A 32" 32" 27" 25" 23" 21" 17"
B 23" 20" 18" 16" 16" 14" 11"
C 26" 24" 22" 21" 19" 17" 13"